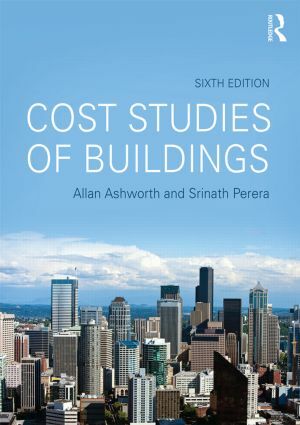 This practical guide to cost studies of buildings has been updated and revised throughout for the 6th edition. New developments in RICS New Rules of Measurement (NRM) are incorporated throughout the book, in addition to new material on e-business, the internet, social media, building information modelling, sustainability, building resilience and carbon estimating. From introductory data on the construction industry and the history of construction economics, to recommended methods for cost analysis and post-contract cost control, Cost Studies of Buildings is an ideal companion for anyone learning about cost management. Allan Ashworth is a Visiting Professor in Quantity Surveying at the University of Malaya, Malaysia. He was recently a visiting professor at the University of Salford, UK, where he had been involved with the work of Centre for Education in the Built Environment. Srinath Perera is the Chair and Professor of Construction Economics at the University of Northumbria, Newcastle, UK. He has over 25 years’ experience in the construction industry and academia, both nationally and internationally. He is a Chartered Quantity Surveyor and a member of the Royal Institution of Chartered Surveyors (RICS) North East regional board. He is also a member of the Australian Institute of Quantity Surveyors.